Spotted these Arches midcentury standing planters at West Elm, which have just been reduced, making them even more appealing. 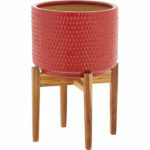 West Elm seems to be having something of a ‘creeping’ sale, with products sneaking into it on an almost daily basis. No doubt that will accelerate once we get nearer Christmas and the full-blown sale kicks off. Buy this is here now, the latest option if you like the idea of planters in your home. They are still big news when it comes to retro homes and have been for a couple of years now. 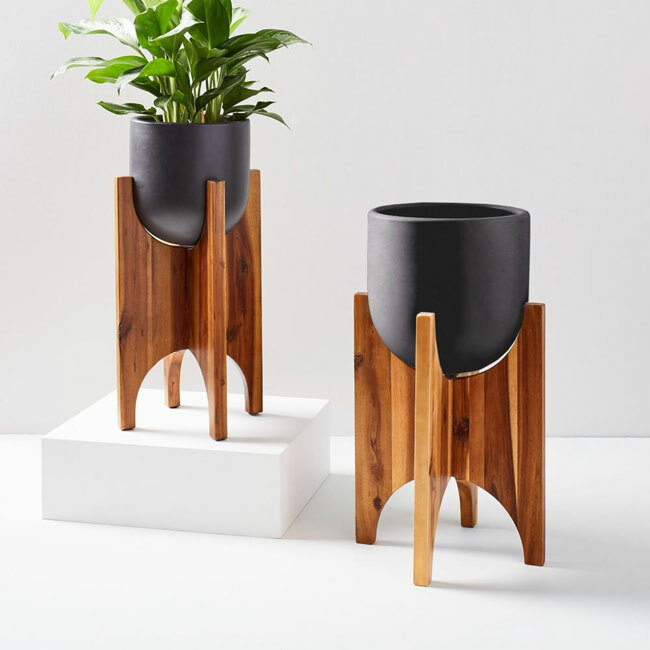 My favourites are the Florian planters at La Redoute (which I think are in the sale right now) and the turned wood leg planters at West Elm. Yes, West Elm is big on these things. But the Arches midcentury standing planters are up there with either of those, not least because they are very different. Take your pick from ‘short and wide’ and ‘tall and skinny’, with the design of both being much the same outside of the proportions. The frames have smooth silhouettes inspired by Brazilian midcentury design, and specifically with solid acacia wood legs in a pecan finish. They support an earthenware planter in Black. Usually £129, they are now down to £103.20 each.